Flawless are back at the Funky End, Aldershot on Friday 13th April and its set to be even bigger than our New Years Eve event. 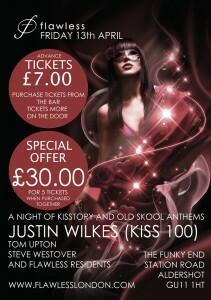 On Friday the 13th April, JUSTIN WILKES (Kiss 100) will be headlining a very special Kisstory set playing alongside the flawless residents. Justin is known for his Kisstory radio show on week day mornings! Please note there will be no guest list for this event. DRESS CODE: To Party! Glamorous & Dazzling.